The Third Southbroom Mixed Classic presented by Pharaohs Construction was a wonderful event. We had a full field, sunny skies, a beautiful golf course and fantastic sponsors. Judging from all the happy feedback, the Southbroom Mixed Classic was certainly enjoyed by all. Once again we hosted a wonderful Pharaohs Construction Mixed Classic over the past weekend. There were 122 players enjoying our beautiful golf course in great weather on Saturday and fairly blustery but dry conditions on Sunday. We had a rather wet Friday when everyone arrived but fortunately things changed for the weekend. Friday evening we had a festive welcoming with our local band, The Southbroom Legends who played music to the tune of Woodstock, the theme of the tournament. Well done Mel Davies, Des Erasmus, Josh Pretorius together with base man Jurgen. 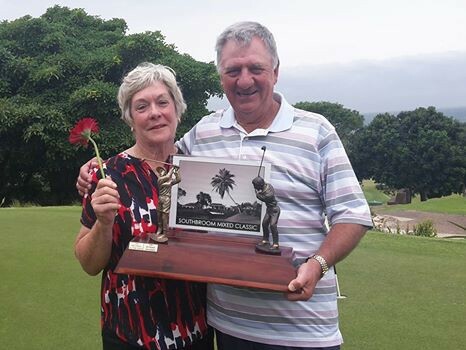 The first day was Greensomes which is always an interesting format with decisions to be made on every hole and the team of Bernie Vorster and Michelle Davis took an early lead with 42 points followed by Bob & Allyson Thomas on a score of 40. The leader board was very tight with lots of teams in contention but all was very friendly. Saturday night dinner dance theme was Woodstock and entertainer Winston Smile put on a great show. It was such fun and really hard to recognize members and friends with their amazing wigs and sixties threads on. Sunday morning dawned fresh and dry with a gentle breeze and a better ball format, which saw scores climb and the tournament came down to the wire.The leading couple of Bernie and Michelle put up a hard fight finishing with a total of 81 points only to be narrowly beaten on a count out by Errol and Trish Amm who made a fine 45 better ball points for their total of 81. The count out favoured the best last day, so the trophy went to long standing Southbroom members Errol and Trish who had travelled up all the way from Cape Town. Southbroom Golf Club is proud to be associated with Pharaohs Construction, the Supreme Winner in the 2014 Excellence in Construction Awards, and we thank Marthinus for seeing value in investing in the Southbroom Mixed Classic and raising the profile of the youngest member of the Classic Trilogy. For a few fond memories, click to see all the pics on facebook!! Click here to be placed on the 2017 invitation list.